Do you eat crabs? Some crab species are among the most popular seafood in the world. Crabs vary in size, color and appearance. Here’s a long list of the most unusual, weird, freak-looking, colorful and pretty crabs. Animals with similar names like Hermit crabs, King crabs, Crab lice, Horseshoe crab and Porcelain crabs are not true crabs. Nevertheless, they are included on the list. The first crab species on the list is the beautiful and attractive-looking Red Spotted Guard Crab. It is scientifically named Trapezia tigrina, a beauty to admire and a uniquely colored crab species. It lives symbiotically with corals and it has been in existence since the Eocene period. 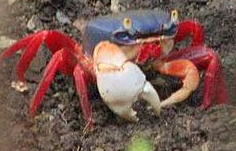 Blue Land Crab is a colorful land crab species that can be found in tropical and sub-tropical estuaries and other maritime areas of land along the coast of Atlantic Ocean. It is scientifically named Cardisoma guanhumi. This crab can grow up to 11 centimeters in width and weigh over 500 grams. This nocturnal and cannibal feeds on leaves, fruits, insects and carrions. The Horned Ghost Crab or Ocypode ceratophthalmus is a unique crab species that lives in the Indo-Pacific region. It has a box-shaped body that grows up to 8 centimeters across the carapace. It is also commonly known as Horn-eyed Ghost Crab. Pompom Crab is a cute crab species native to the Hawaiian Islands. Its scientific name is Lybia edmondsoni and inhabits depths of 0.30–30 m. This beautiful crab can grow up to 13 mm in width. The carapace sports unique polygonal patterns in yellow, brown and pink. It lives symbiotically with Sea Anemone. It is also known as Boxer Crab and is known in Hawaii as Kumimi Pua which means “inedible flower crab”. Atergatis subdentatus is a beautiful species of crab that can grow a carapace of approximately 6-8 inches across. Carpilius convexus is a colorful crab species that lives in the Indo-Pacific from Hawaii to the Red Sea and South Africa. Carpilius maculatus is a beautiful crab species with unique markings. It belongs to the genus Carpilius of the Carpiliidae family. The specimen on the above picture is on display at the national Museum in Prague, Czech Republic. Red Rock Crab or Cancer productus is a colorful crab species found on the western coast of North America. It can grow up to 20 cm in width and its coloration is diverse, often white, sometimes with red spots, or zebra striped. Mouthless Crab or Cardisoma crassum is truly a unique and colorful crab species. This terrestrial crab can be found in the coastal tropical eastern Pacific Ocean. The shell of this crab is purple-bluish, its legs are red and its main pincer is white. Potamon fluviatile is a species of freshwater crab found in streams, rivers, ponds and lakes in Southern Europe. It can grow up to 5 cm and can live up to 12 years. It inhabits burrows and are aggressive, apparently outcompeting native crayfish. Callinectes danae is a crab species that can be found in South America. The specimen on the above picture was taken from the Patos Lagoon Estuary, Rio Grande do Sul, Brazil. Johngarthia lagostoma is a species of terrestrial crab that lives on Ascension Island where it is the largest native land animal. It grows to a carapace width of 11 cm and exists in two distinct color morphs – one yellow and one purple, with few intermediates. The Red Rock Crab or Plagusia chabrus is a marine large-eyed crab that lives in the southern Indian Ocean and Southern Pacific Ocean. It can also be found in Australia, Chile, New Zealand and South Africa. The Calico Crab or Hepatus epheliticus is a beautiful crab species characterized by large red spots all over its carapace, legs and pincers. It is also commonly known as Dolly Varden Crab and Leopard Crab. It can be found in the western Atlantic Ocean in inhabits shallow waters. The Painted Ghost Crab or Ocypode gaudichaudii is a beautifully colored crab species that can be found on Pacific beaches from El Salvador to Chile. It is also commonly called Cart Driver Crab. It is red-orange in color with sandy dots across the back of the carapace. The Angular Crab or Goneplax rhomboides is a uniquely-shaped crab. Its name was taken from the angular shape of its carapace. It is also called the square crab although its shell is in fact more trapezoidal than square. This species is also known as the Mud-runner because it is capable to run away quickly when threatened. The Striped Shore Crab or Pachygrapsus crassipes is a colorful small crab found on rocky and hard-mud shores of the west coast of North and Central America. It is also known as the Lined Shore Crab. Its carapace is square and can grow up to 5 cm. Nimble Spray Crab or Percnon gibbesi is a colorful crab species that can be found on both sides of the Atlantic Ocean and on the Pacific coast of North America. It is also commonly known as the Sally L:ightfoot Crab or Urchin Crab. It has been described as "the most invasive decapod species to enter the Mediterranean". The Purple Rock Crab or Leptograpsus variegates is a colorful species of crab that can be found in southern subtropical Indo-Pacific region. This marine large-eyed crab grows up to 5 cm. Guinotia dentata is a freshwater crab species that belongs to Pseudothelphusidae family. It can be found in mountain streams in the Neotropics. Ashtoret lunaris is a beautiful crab species that belongs to the genus Ashtoret of the Matutudae family of crabs. The above picture of Ashtoret lunaris was photographed at Nagasaki prefecture, Japan. This freak and weird looking crab species is commonly known as Yellowline Arrow Crab. Its scientific name is Stenorhynchus seticornis. It is also simply called Arrow Crab. It has long and thin legs that grow up to 10 cm and its body is triangular with a carapace of up to 6 cm in length. They are commonly kept in reef aquariums to control bristle worm population. The Oyster Crab or Zaops ostreus is a small, whitish or translucent crab species that lives inside the gills of an oyster or a clam. It uses the oyster for protection and lives on the food that the oyster gets for itself. It is found in oysters in the North Atlantic Ocean. The crabs are eaten as a delicacy. Mangrove Tree Crab or Aratus pisonii is a crab species that lives in mangrove trees in tropical and sub-tropical parts of North and South America. It feeds mostly on the leaves of the mangroves and animal matter. Bristly Crab or Pilumnus hirtellus is a small crab species covered in hair. It lives in shallow water and feeds on carrion. It is also called Hairy Crab. 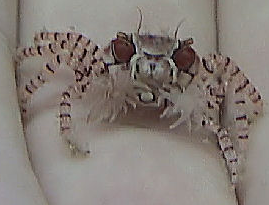 The Mictyris brevidactylus is a unique crab species that is found in Japan, China, Taiwan, Singapore and Indonesia. It has a light blue carapace and scarlet jointed legs and will burrow into the sand when disturbed, in a corkscrew motion. The Warty Crab or Eriphia verrucosa is a weird-looking but colorful species of crab sometimes also called the Yellow Crab. It can be found in the Mediterranean Sea, Black Sea and Atlantic Ocean. It can reach a width of 9 centimeters and a length of 7 cm. The Horsehair Crab or Erimacrus isenbeckii is a weird-looking crab species that can be found in the Sea of Okhotsk and the Pacific Ocean. It is frequently used in the Japanese cuisine and is known in Japan as Kegani. It is also sometimes called Helmet Crab. The California Rock Crab or Romaleon antennarium is a crab species that can be found on the western coast of North America. This unique crab has a fan-shaped carapace with eleven teeth to either side of the eyestalks. It is also commonly called Pacific Rock Crab. Northern Kelp Crab or Pugettia productus is a unique crab species that belongs to Epialtidae family of crab. Northern Kelp Crab can be found along the Pacific Coast from southern Alaska to northern Mexico. It feeds on kelps, hence its common name. It can grow a carapace of up to 9 cm. Sheep Crab is a freak-looking crab species that belongs to the Majidae family of crabs. This crab with very long legs has exoskeleton covered with bristles to which the crab attaches algae and other items for camouflage. It is scientifically named Loxorhynchus grandis. The Pea Crab or Pinnotheres pisum is a small species of crab that lives as a parasite in clams, mussels, oysters and other bivalve species. This creature solely relies on its host for food, safety, and oxygen. Other hosts include sea urchins and sand dollars. Scorpion Spider Crab or Inachus dorsettensi is a crab species generally found on loose substrates from 6 meters depth down to about 100 m. this crab can be found on the east coast of the Atlantic Ocean and also in the Mediterranean Sea. It is usually covered with sponge and grows to a carapace of 3 cm. Sleepy Sponge Crab or Dromia dormia, is athe largest species of sponge crab growing up to a carapace width of 20 cm. it lives is shallow waters across the Indo-Pacific region. This crab camouflages itself by carrying a sponge on its back, which it cuts to size with its claws, and then holds in place with its last two pairs of legs. It is also commonly known as Common Sponge Crab. Calappa japonica is a unique-looking crab species that can be found in Japan. Gandalf Crab or Gandalfus yunohana is a species of crab named after the character Gandalf from The Lord of the Rings. It is found on hydrothermal vents on the eastern edge of the Philippine Sea Plate south of Japan. It can grow up to 4.1 by 2.58 cm and lives at depths of 420 – 1,380 meters. The Sand Bubbler Crab or Sand-Bubbler is a small species of crab that lives on sandy beaches in the tropical Indo-Pacific regions. These unique creatures form inflated sand pellets during low tide which are destroyed by the incoming high tide. It can grow up to 1 cm across the carapace and they are characterized by the presence of "gas windows" on the merus of the legs. Its scientific name is Scopimera globosa. The Long-legged Spider Crab is a unique-looking species of crab that can be found in the Belgian Continental Shelf. This crab belongs to the Macropodia genus of the Inachidae family. these are some cool crabs!